Using Ubuntu 12.04, 64-bit version, installed on Lenovo X220 laptop. Fresh "default" install and settings configuration. When the laptop is plugged into a power source, the touchpad's onscreen cursor (the white arrow that shows position) shakes excessively when trying to use the touchpad to control the cursor. The shaking is so bad that it essentially makes the touchpad unusable. For example, trying to click the minimize button in a window's upper left corner will routinely result in accidentally clicking the close button because of the cursor's shaking. The problem is NOT present when Ubuntu is running on battery. But this means I can never have Ubuntu plugged in and charging while I use it, which is very inconvenient at times. I'm using the power block and cable that came with the X220. But I also tried using a larger power block and cable that came with another Lenovo model - this power block is approved for use with the X220 and is sold on the Lenovo website as an X220 accessory. But this larger power block did not improve the shaking behavior either. I have no special settings enabled for the touchpad. But changing the settings has no effect on this shaking behavior either. 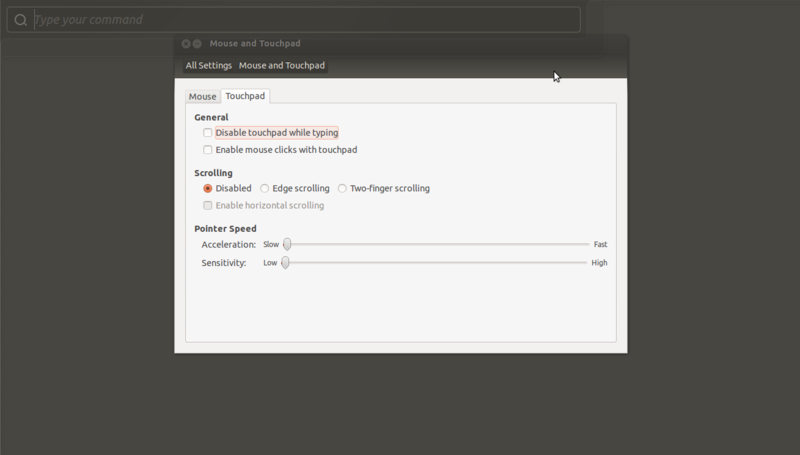 I attached a screenshot of my Touchpad settings [please excuse the HUD's presence - I cannot get the HUD to NOT appear when I press ALT+PrtSc to take a screenshot (I guess this is another bug)]. I don't know, is this is helpfull, but this bug affects me too. But, i have two diferent adapters, one with earthing ( i hope, this is the correct word, one with 3 "cables" go to wall) and one without ( only 2 cables, i buy it for have to adapters, one for home use, one for traveling ). With one, that is with earthing, this problem don't appear, but with that one without, problem ocurs. One friend of me told me, that there might be problem with touchpad and not earthing adapter. But, here is another thing. When i plug in adapter which brings problem ( that without earthing ), problem occurs. But, when i connect my USB hub which has own adapter, shaking is smaller, but when i plug in my HDMI monitor, which has cable with earthing, problem totaly disappeared. So, i hope, i was helpfull somehow... But if I'm right, i don't know, what can software do for removing this problem. PS. : sorry, if I broke some rules of this bug reporting, but i never do this before and i just wan't to help. My shake is more moderate than described, and generally mostly occurs when I am staying still. When I actually move around the shaking isn't so bad. It's also very on and off: sometimes it's there, sometimes not. I didn't notice until I read this bug report that unplugging made it go away because it was so inconsistent. I have a DELL XPS 14z. I first thought it was an hardware problem and I'm glad to see it isn't. I didn't think about the charger at first but it is now obviously related. It stops shaking on battery. "Not sure how to fix this without some larger rework in the smoothing code. 8 is the default, increase the numbers (x and y) until you find something useful." There are same problems on Thinkpad x220( 2011 years) 64bit with Ubuntu 13.04 64bit or Mint 13 maya cinnamon. It occurs for me when power adaptor plugged in while I am outside like cafe but works good in my house. This bug also affects me on Linux Mint 15 Olivia running MATE 1.6.0 as well as previous Mint versions. and the issue virtually disappeared, making my touchpad usable for the first time. I will reboot the system, test it for some time, and if find anything relevant will post back. I have the same issue. I have a DELL XPS 14z running Ubuntu 13.04 64 bits. My Lenovo has the same problem of the arrow shaking. I unplugged the power cord and it stopped shaking. So then I plugged the power cord in again and the arrow starting shaking. I switched power outlets and it still shook. So then for some strange reason I let one corner of the laptop rest on top of the back of my left hand (while the power cord was plugged in) and the shaking stopped. I tried to prop it up with a folded hand towel and then a piece of thick rubber instead of my hand, and the arrow shook. So perhaps the problem has something to do with vibration and electricity, short circuit, bad design in wiring????? I have two lenovo laptops and when I used the charger from the T61 into the X220. The mouse start shaking on touching the mouse pad. No idea why this happens, but may be this information helps in diagnosis. Brendan Griffin, this bug was reported a while ago and there hasn't been any activity in it recently. We were wondering if this is still an issue? If so, could you please test for this with the latest development release of Ubuntu? ISO images are available from http://cdimage.ubuntu.com/daily-live/current/ . Please ensure you have xdiagnose installed, and that you click the Yes button for attaching additional debugging information. Please note, not filing a new report will delay your problem being addressed as quickly as possible. The original reporter seems to have dissapeared and I have exactly the same laptop and problem! The problem is related to electrical interference from the power supply (see http://superuser.com/questions/76649/laptop-touchpad-works-incorrectly-when-on-power-supply). As suggested by users here, increasing the noise threshold helps. In my case, this problem happens because I am using a cheap ebay power supply that was not manufactured by my laptop's maker. When i bought a new charger as the oringinal got chewed(stupid dog) i noticed my mouse started to shake but wasn't quite as bad as that, well sometimes it was unusable and quickly figured the charger was causing it as it stopped when taking it out, haven't found a actual permanent solution... but..
what i found that made it go away is making sure the charger wire and everything as straight as possible, well not having to be straight but the wire not meeting/touching at all itself at all. I'm having the same problem on Lenovo Thinkpad Edge E540. I'm using the original Lenovo charger and battery. I just noticed that the problem exists even when an external display is connected in VGA port and power chord is not connected. Therefore it cannot be the external power source that is the problem but it's a more generic problem when connected to external devices. I have the same problem, on Asus k55v with Ubuntu Gnome 16.04 LTS. If i use it unplugged, than its ok, while when its hooked up to the power grid the cursor constantly jiggling. In the meantime: my charger died a week after, i got a new one and the problem disappeared. So it wasn't a software bug in my case.